This June (2009), Bishop Ratko Peric of Mostar-Duvno in Bosnia and Herzegovina sent letters to the pastor and a parochial vicar at Medjugorje, with specific directives about how they and the parish are not to promote the alleged apparitions of the place. 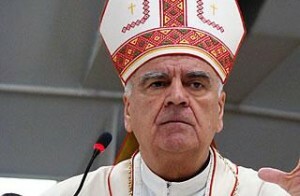 Bishop Peric is the ordinary of the diocese in which Medjugorje is located and per Paul VI's 1978 CDF instruction "Norms for the Congreagtion for Proceeding in Judging Presumed Apparitions and Revelations", has jurisdiction over affairs at Medjugorje. The English translations became available last month and are available in their entirety at Catholic Light (here). The Bishop uses some very strong language and made some substantial directives on how things are to be done in Medjogorje. Here are the most important points of the directives, though I suggest you read them in full. "The rule is still valid that in the parish of Medjugorje priests coming from elsewhere are not permitted to conduct retreats or spiritual exercises, nor to hold conferences, without the approval of this office. Analogously, neither foreign nor domestic priests can promote alleged "messages" or "apparitions" which have not been proclaimed authentic in that church or on church property." "The parish of Medjugorje cannot be called a shrine, neither privately, nor publicly, not officially, because it is not recognized as such by any level of competent ecclesial authority. And that wording cannot appear on the web site of "Medjugorje - place of prayer and reconciliation", where it is currently found in many places....As the local Ordinary, in this present letter, I declare that the so-called "shrine" has no mission to declare itself a "Shrine", nor to present (the parish) with that title, because it has no ecclesiastical mission to present itself in the name of Medjugorje, nor to spread or interpret the "apparitions" and "messages" of Medjugorje." "In September 2007, on the occasion of your installation in the office of parish priest, I indicated to you that the so-called "seers" cannot present themselves on any occasion to promote their private "apparitions" and "messages", nor to preside, nor to have anyone preside in their place, at the recitation of a certain number of prayers "received" in an "apparition". Therefore, they cannot use prayers from scripture or those approved by the Church as a means of introducing "numbers" and "messages" from the private "apparition"." "It is equally not permitted to introduce intentions received in an "apparition" or "message" during the prayer of the Rosary of Our Lady. We have sufficient official intentions (from the Pope, from the bishop, for the missions) and there is no need to arbitrarily have recourse to alleged apparitions and messages and mix them with the Church's public prayers." These preceding directives all came in a letter dated 12 June 2009 to the parish priest of Medjugorje. The following excerpts come from a second letter, dated the same day, to the Franciscan parochial vicar of the parish, Danko Perutina. "Marija Pavlović, married name Lunetti, daily "seer" who lives in Italy, and temporarily also at Medjugorje, sends to the parish office or to some one of your pastoral workers in the parish of Medjugorje, her "message" of the 25th day of the month, which is then published on the Medjugorje web site and in other mass media. And you regularly make commentary on the monthly "message", which is published in various languages. When I asked how the "messages" of the 25th were published, and not the other "messages" said to be "private", I did not feel I received a clear and convincing answer. I do not know who has sent and authorized you to comment on them and publish them on the site. What sort of person is assuming the right to decide that some "messages" be omitted and others published, and that this is done through the parish office and the site connected with the parish of Medjugorje?" ...To avoid any misunderstanding, in this present letter I declare that you, according to my decree, are not authorized, either in the name of the parish office or as parochial vicar, to comment upon and publish the "messages" of the 25th or any other day of the month. These are private "messages" of private persons for private use. And we cannot permit that this is given the form of a message from the parish office, from the parish priest, or any parochial vicar, or even of the "Shrine" which is not recognized as such at any level: not diocesan, or the level of the episcopal conference, or of the Holy See." We may be mistaken, but Bp. Peric seems to be forbidding any communication of the alleged "messages" whatsoever other than on the entirely private level. The letter to the pastor of Medjugorje prohibits seers from delivering messages in person, and his directive to Danko Perutina prohibits them from sending messages abroad to be published. This rules out any type of official mass communication of alleged "messages." "We are gradually succeeding in distancing the unrecognized "apparitions" and "messages" from the parish church and from church property, and the appearances of the "seers" before or after Holy Mass." Why would the Bishop want to do this? For the obvious reason that these messages are unapproved, will not be approved, and are so dubious that the local Ordinary wants everybody to understand that the local Church does not endorse them. Can anybody really think that this bodes well for Medjugorje? It is gradually being distanced from the official Church and will someday be condemned, at which point it will either peter out (hopefully) or go into schism. "Yes, but the fruits, the fruits..."
Having visited Medjurgorje and been present at an apparition last year, I have a great love and belief of Medjurgorje and its visionaries. I think to allow the opinions of skeptics, and legislation to cloud what is so obviously apparent in Medjurgorje, is most sad. For in Medjurgorje resides an amazing truth and blessing that can only be acknowledged as grace, that we are blessed to know of in our lifetimes. To have fear of Medjurgorje being discredited,is to doubt Our Blessed Mother,as it is Our Dear Mother who is in charge of all that happens there. Just as Our Lady, has changed the fate of Medjurgorje and so many attending pilgrims, with her blessing and presence. I have faith she shall also alleviate those who doubt her. To not have faith in this instance, is to limit the Lord by our own meagre failings. It is doubt which is of fear and not the Lord. It is faith which is of love and the Lord. Let us instead keep praying and fill ourselves with faith. Shocking the luekwarm through violence? Vote to support a local Pro-Life charity!